One of the great things about Crete is that it is full of holes. The island is predominately limestone which is easily dissolved by slightly acidified water to produce rocks that look like this, a feature known to geologists as karst. Some of these holes are rather big and I thought we’d investigate one of them today. So, torches in hand, let us wander up into the Thriptis mountains and explore the Cave of the Two-toned Goat. Its correct name is Vreikos Cave but whenever I come up here this goat is always standing sentinel: I’m not sure if it’s a white goat that has stuck his head in a tar pit or a black goat that has sat in a tub of ice-cream but he’s certainly distinctive. As we walk along the rough track to the cave I’ll just point out some of the wild flowers to you as we go. This pretty little mauve one is an iris (Iris unguicularis) and the pale yellow job with the disk shaped seeds is Buckler Mustard (Biscutella didyna). The prickly shrubs currently tearing our ankles to shreds is Greek Spiny Spurge (Euphorbia acanthothamnos). Oh look, a lizard just disappeared under that one. The other shrub littering the mountainside is Milkwort (Polygala verulosa). Notice how both shrubs are compact and mat forming with small leaves. You either have to be tough to survive the conditions up here all year round or make your appearance briefly to flower and set seed before snuggling up underground again which is what this orchid (Orchis anatolica) is doing. 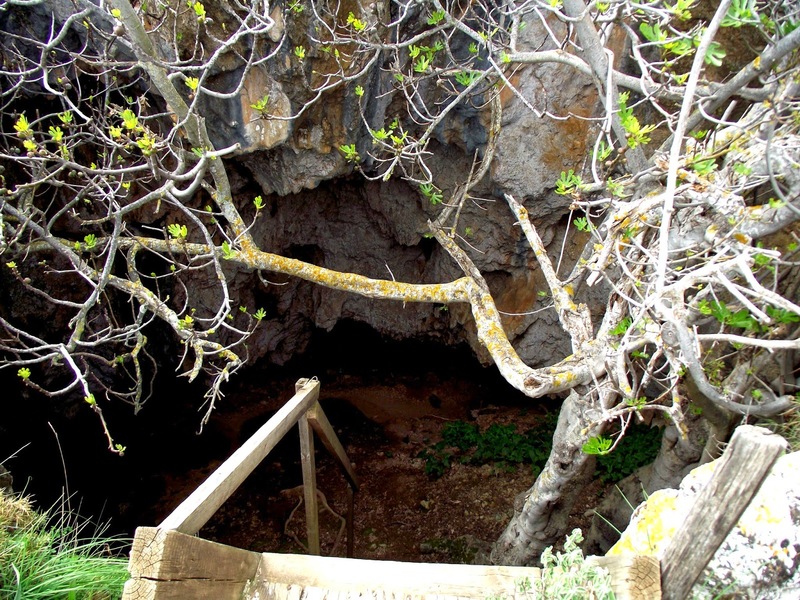 Here’s the entrance to the cave and another sentinel: a fig tree. What with two-toned goats slyly eyeing us from the rocks above and the twisted fingers of the fig beckoning us from below it feels as if we’re entering into a world of myths and legends. Naturalists in The Underworld, I wonder if we’ll meet Orpheus down there? Best to go down backwards I think. This is a swallow hole or sink hole, formed when a cavity beneath the surface can no longer support the weight of the ground above it. Just like the ones we see on TV swallowing cars and houses occasionally. Now here’s an interesting plant growing on the wall. It’s Heart-shaped Valerian (Valeriana asarifolia). Valerian has been used since the time of Hippocrates (he of the Hippocratic Oath taken by doctors worldwide) as a sedative and cure for insomnia. Scientists are still debating its efficacy but I’ve tried sprinkling a few drops of an infusion of another species of Valerian on my pillow at night and I slept like a log – but there again I always do, so that’s hardly conclusive proof. It smells sweet though. Choices. Now we’re down at the base of the swallow-hole we can go left or right. The left looks steep and slippery and the right looks slippery and steep. Left looks as though it goes down further so we’ll start down there. There’s a distinctly green tinge down here which denotes the presence of copper. 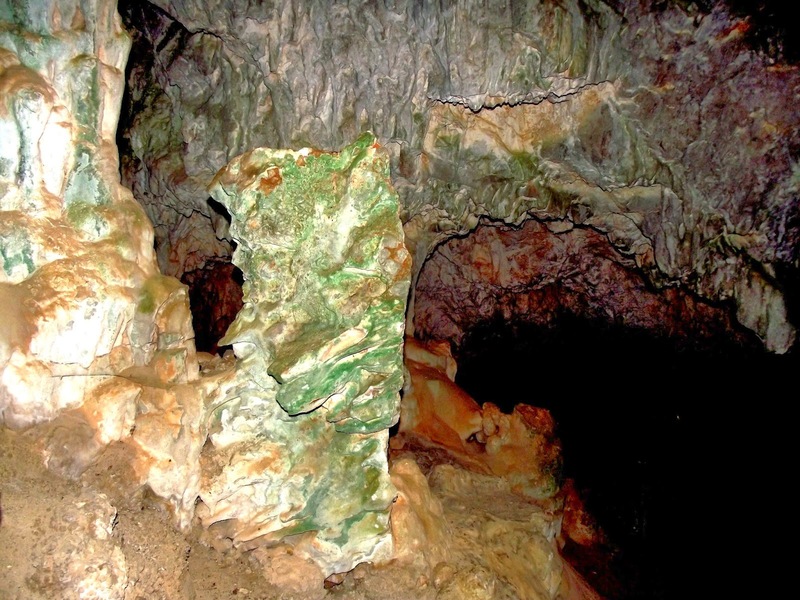 Just look at that column, those beautiful greens are produced by the weathering of copper ores. The stone is called Malachite and there’s a huge vase (bigger than me) made from the stuff in the Hermitage Museum in St. Petersburg, Russia. This next bit is tricky so watch your footing. Look out, bat coming through. No I didn’t see what species it was. We have sixteen species on Crete including Hanaki's Dwarf Pipistrelle which was only discovered here in 2004 having previously thought to be endemic to Libya. I’m afraid all I saw was a ball of fur with wings that almost collided with my face. (Being English I, of course, apologised to it immediately.) Here we are at the next level. Wow, silvery grey stalagmites. We could really do with a mineralogist down here with us. My guess would be a lead-zinc ore but that really is only a guess. I’d estimate that we are now approaching a depth of one hundred feet below the surface and though the cave goes deeper I think we’d be unwise to progress any further without a back-up team. What we’ve seen so far has been truly awe inspiring (or even ore inspiring) and the feeling of other-wordly isolation is beyond words. Being in a commercialised cave with dozens of other tourists just doesn’t hold a candle to being down here alone with a torch and the echoing drip, drip, drip of work in progress. Let’s go and explore the other tunnel. Daylight. We’re back at the fig tree. It looks as if we’ll have to bend double to go down here so mind your head. It’s nowhere near as steep after the first bit and the floor flattens out but it’s littered with rocks so be careful not to turn an ankle. No more bats, I suspect that they’re further in. As far as I can tell there is just the one chamber here but look at those mighty columns, I doubt if two of us could get our arms around this one. The reddish hue, I believe, denotes the presence of iron ores. (Note – the colours in the photographs are all natural and haven’t been enhanced. They were taken with a perfectly standard Fujifilm digital camera with flash and I’ve merely tweaked the exposure and contrast to make them stand out from the background. SD). So here we are, back in the world of the living again. The skies are darkening with clouds from the south so the temperature difference is not noticeable. I expect that in the height of summer it feels quite chilly when you emerge. Look up there above the crags – a Griffon Vulture. Very often, when you see these huge birds hanging in the air, you see their “fingers” outstretched and turned up. They do this to reduce the vortices of air that build up at the tips of their wings (their wingspans are about two and a half metres or eight feet) and reduce drag. At present Jumbo Jets and Dreamliners don’t use this neat trick but I understand that the military are looking into it. I suppose they have a bigger budget than anybody else for investigating such things and it’s pleasing to know that even the military cloud has some sort of silver lining even if it’s just a touch of avian research. Now if you’re still feeling energetic we can walk from here and right down through the Pefki Gorge to the seaside town of Makry Gialos. Don’t let me stop you but personally I’m all in favour of a spot of lunch and a leisurely drive home. 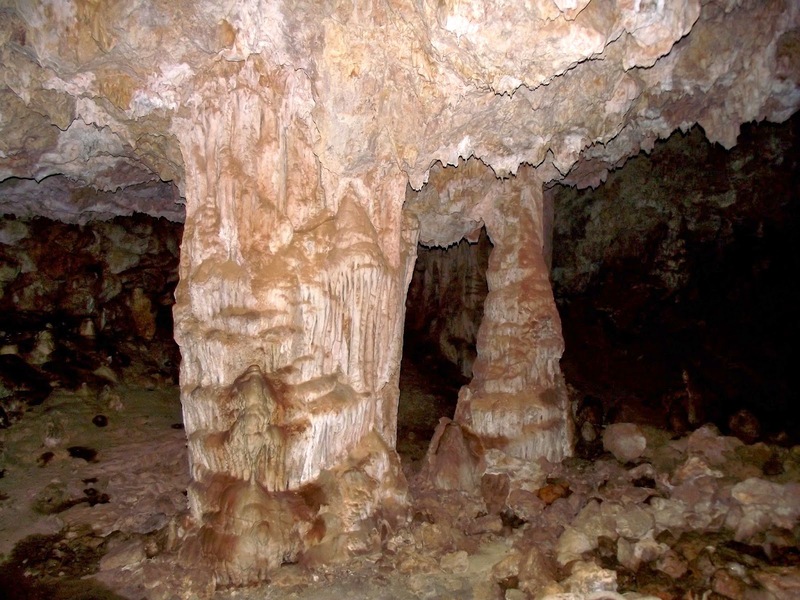 I still can’t get those stalactites and stalagmites out of my mind. What a magnificent planet we live on. If you fancy a bit of Cretan caving then feel free to contact me via the Naturalists Group on facebook. Anyone’s welcome to join and discuss the things we’ve seen. By the way, I’ve added a few “share” buttons to the bottom of the blog so feel free to pass it around. The more the merrier. Until next week then – good hunting. 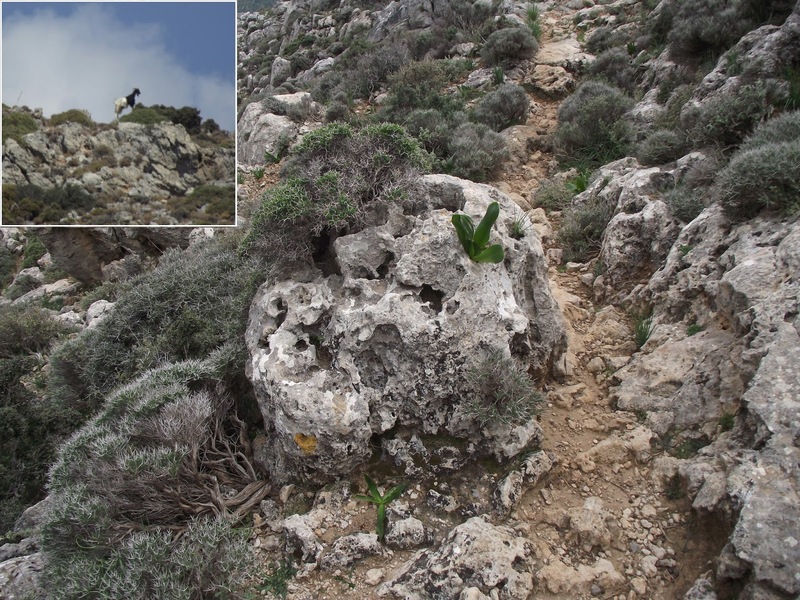 Special thanks this week to Julia Jones et al at Flowers of Crete to whom I delegated all of the flora identification. Thank you for this Steve. 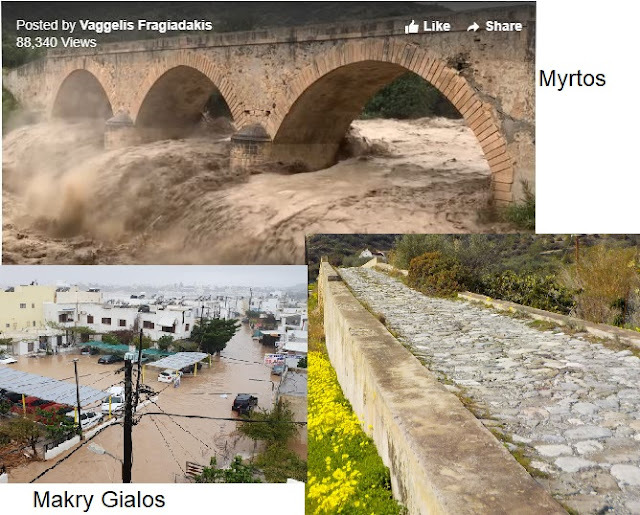 I've found your blog via Explore Crete and will certainly keep visiting!